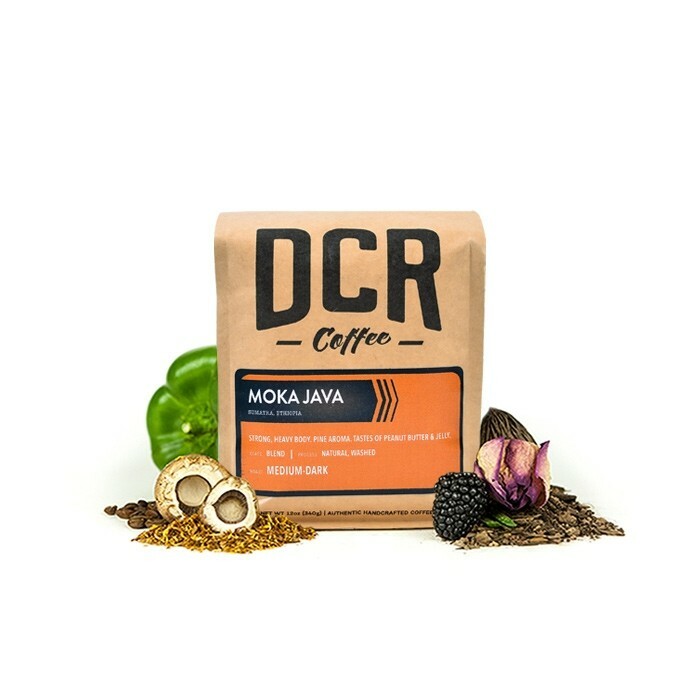 The Moka Java Blend was carefully roasted for you by Dillanos Coffee Roasters. The oldest blend in coffee history, this is a blend of coffees that were traditionally shipped from the ports of Mocha in Yemen and Java, an island in the Indonesian archipelago. This cup is complex and full bodied, with earthy and baking spice notes. Tasted like spoilt milk. Please don't send again. Great, full-bodied coffee with slight cocoa notes. Pleasant. Upon opening the bag I got a the scent of slightly burned beans which was unfortunate. Fortunately, after grinding I got hints of the baking spices and fruits...was dissapointed that it was not heavy bodied as labeled...more of light/medium..the flavors (thankfully) weren’t of peanut butter and jelly though, I tasted tartness and citrus instead of the baking spices. I tend to favor nutty/earthy coffees however, this Moka Java’s citrusy and tart flavors weren’t really unfavorable to me. Personally, it was just “ok” and would not purchase again. Was not my favorite. Tasted too fruity and not earthy/chocolaty enough for me. I didn't like the Baking Spices flavor to it. Love this coffee! Hefty flavor without being acidic. Very good, Moka Java has the fragrant kick the name suggests. Good coffee, easy to brew. Nothing outstanding about it, but a solid cup. Medium body and citrusy! Flavorful! The beans were fairly burnt and the that really takes away from the flavor notes of this coffee. A true bummer. Good, solid coffee. Followed the pour over instructions on the package. Really loved the spice notes in this coffee, I used a percolator to make my first batch and appreciate the caffeine level and flavors. While this blend is complex and tasty, it is also very light, and much too light for our tastes. We prefer a more bold coffee, partly because we add cream. This coffee has wonderful flavors and is not bitter, so is easily consumed just black, with no added cream. This is the driest coffee I have tasted. Front notes are little nutty with an earthy aftertaste. Light body. I didn't taste as much chocolate as I expected, and was surprised that I liked the subtle earthiness or didn't think it was overpowering. Overall, I find this coffee pleasant to sip, but the flavors just feel a little flat/dull to me. Close to being a dark roast but flavors come through very nicely. This is nice, but the taste might be a bit too strong. We still very much enjoy it, but it might be a bit darker than we normally drink. I do like coffee with a bit of a punch, so perhaps it's just the particular flavor of this one. Good morning cup of coffee, earthy, slightly nutty with a bit of acidic finish. Wasn't dark enough brew. Would like it nuttier! I'd give this a 4 1/2 if I could (instead of just a 4). Very flavorful and full tasting. I question the terms "fruity" and "juicy" as descriptors for coffee, but I can confirm "baking spices" and find that aspect accurate and desirable. For clarification though, I'm not a fan of spiced coffees or flavored coffees that some folks like around the holidays. This Moka Java is very good according to my palate! Not a bad bean, but even after playing with water temp, grind, and brewing method there were still no fruity or juicy flavor elements. Maybe light caramel, but nothing else. Description didn't seem very accurate. Great coffee! Love the taste and worked especially well with a French press. Would definitely get again! Nice full body with some fruity undertones. My husband and I loved this blend! Perfect for breakfast Very aromatic with delicious flavor. Smooth and you can definitely pick out the fruity notes. Great coffee! Not bad tasting at all. Not quite what I was looking for though. Maybe something without the fruity/spice next time. Maybe nutty earthy? As you can tell I am not well versed in coffee terminology. BTW by the time I get my next bag of coffee I will have a grinder so can experience fresh ground coffee. Terrific first Mistobox delivery with amazing aromas! We thought this coffee was really smooth and delicious. I don't generally think of coffee as being fruity, but if that's what this is, it's great! Finished our Moka Java blend from Dillanos. We both liked it. I rated it a 5; my wife a 4. She wished it was more bold. She got the fruit notes. I accidentally reviewed this before receiving the coffee. Will adjust after I drink it, if necessary. Not what I was expecting for a first coffee! It tasted okay, for a Moka Java, but I couldn't get past the overly roasted flavor of the coffee. I understand it is a dark roast coffee, but I did not care for the fruity and juicy notes of this coffee. Good aroma from whole beans, ground beans and while brewing. Excellent body, but some of the subtleties were lost to what I assume was a darker than intended roast for this batch. Medium roast with full body. Needs to be ground finer than usual. Delicious. Taste like burnt coffee flavored sawdust. Worst bag I have ever received. I think this is what the street coffee vendors use. Rich and smooth spice--the kind of coffee you can drink all morning and all day. This is a great blend. I loved it. Great flavor and smooth. Well rounded. Nice flavor, great smell after grind. Beautiful coffee. The earthy taste of Sumatra hits first, followed by a pleasant berry, almost wine like aftertaste. Tried it with a lemon cake, matched the juicy notes perfectly.